TechniTrader Stock Trading Publication "Daily Market Educator" review - by Patti - "I have felt my abilities improving but to have confirmation like this helps greatly to reinforce all that I have learned." Tonight as I read your (TechniTrader Daily Market Educator) DME for Tuesday, I am smiling and jumping for joy. Why, you ask? Because I had analyzed SMCI on Sunday night EXACTLY as you defined it today. Right down to the financials. I have felt my abilities improving but to have confirmation like this helps greatly to reinforce all that I have learned. I still paper traded quite a bit as I have been burnt in the past. Thanks for all the constant training and reinforcement. I live to trade another day. TechniTrader is "The Gold Standard in Stock Market Education." Go to the TechniTrader.com Learning Center and watch a wide variety of webinars, to experience for yourself the excellence of TechniTrader education. 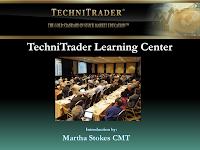 TechniTrader Subscription Publication "Daily Market Educator" review - by Mike S. - "It is a very well written, succinct, lucid, and easy to follow"
Thank you (Martha Stokes CMT) for sharing your (TechniTrader Daily Market Educator) letter overview. It is a very well written, succinct, lucid, and easy to follow. Additionally, it is heart felt honest, and good advice, as directed to all of us. I wish someone would have given me directions like this 30 years ago. You do a great job of teaching. TechniTrader Stock Trading Support Publication "Daily Market Educator" review - by Supriya - "Your Daily Market Educator lessons are helping a lot and now I am able to find more and better picks." Your Daily Market Educator lessons are helping a lot and now I am able to find more and better picks. Also, the lab courses are excellent. I am paper-trading and keeping the trade journal up-to-date. Every day is exciting in terms of education. Once again I thank you from the bottom of my heart for creating such a wonderful (TechniTrader Methodology Essentials Standard Course) course for us small investors/traders. TechniTrader Student Scholar publication review- by Tyronne P. - "Once again TechniTrader is providing timely information." This Student Scholar report (TechniTrader student support publication for August) hits home to me, because I'm in the IT space and I am a huge cloud proponent since 2012. I understand the cloud from the perspective of IT consumption, capability consumption, and how IT is becoming a service and when you look at the capabilities that were once the domain of IT that are now done as a service. Look at the various capabilities offered as a service. We now have: Online learning, HR, IT, Call Center, Banking, and more. Once again TechniTrader is providing timely information. TechniTrader Subscription Publication "Daily Market Educator" review - by Gary O. - "I can't remember the last time I was so excited as I am now about learning"
Boy were you right on your interpretation about the market this week (in the Daily Market Educator)! I'm feeling really good about the class and my attitude about learning. I have a terrible commute and the whole time I'm driving, the 'little investor' in me is saying: "You should be home studying those charts!" I can't remember the last time I was so excited as I am now about learning. TechniTrader Subscription Publication "Daily Market Educator" review - by Mike J.N. - "it was sure helpful to me and to others as well, I am sure." Thanks Martha for covering the Buy Side Sell Side issue in the "Daily Market Educator." I am trying to get my mind around these concepts but it is quite difficult. Still you covered a lot of ground and it will eventually soak in after further exposure. Don't know if you covered this as a result of my questions the other day, but it was sure helpful to me and to others as well, I am sure. TechniTrader is "The Gold Standard in Stock Market Education." Go to the TechniTrader Learning Center to watch a variety of Webinars, and experience for yourself the excellence of TechniTrader education. TechniTrader Stock Trading Courses support publication REVIEW "Daily Market Educator" review - by Robert K. - "The examples you show in the DME’s are my main guide." I took to heart one of the (TechniTrader Subscription Publication) "Daily Market Educator" DME’s on how to get the bad habits eliminated in my trades and getting my confidence back. If I was to say I have one weakness, it would be picking up on the fundamentals of a specific company. I still check the financial sheets and I admit, I am just going through the motions. I look for specific signs I have been taught without the full understanding of what I am looking at. The examples you (Martha Stokes CMT) show in the DME’s are my main guide. TechniTrader Subcription Publication "Daily Market Educator" review - by Dave G. - "Today's DME (Daily Market Educator) was fabulous"
Today's DME (Daily Market Educator) was fabulous. I am a bit of a history buff and totally agree with your (Martha Stokes CMT) analysis. Our Ontario government laid out a program for home owners to qualify for grants, relating to energy efficient renovations. TechniTrader Stock Trading Courses support publication "Daily Market Educator" review - by Kaaren W. - "I thank Martha for all her good training and I listen to her good advice." After reading Martha's (Daily Market Educator) DME today I just wanted to send an email of reassurance that I have taken her advice seriously about simulator trading. During this whole correction phase I have not wanted to put my real money at risk. I have been paper trading every day, journaling each trade as though it were live, watching all my stocks on my watchlist how they have re-acted under the pressure and learned a great great deal. I have spent time going over old studies and am preparing myself for when the market makes more sense to me. I haven't wasted my time. I am taking advantage of learning how to trade a Trading Range Condition for the future, on paper first. I thank Martha for all her good training and I listen to her good advice. Please let her know that I appreciate all her good intentions. Martha is my rock. TechniTrader Stock Trading Courses support publication REVIEW "Daily Market Educator" - by Michael C. - "Martha's comments each day and the (Daily Market Educator subscription publication) DME really help to dispel the garbage that is out in the media." A light bulb has gone on in my head and my trading percentages have escalated. I still have a long way to go but the bleeding has stopped, I am now rebuilding my account slowly. Slow and steady. Martha's (Matha Stokes CMT) comments each day and the "Daily Market Educator" DME really help to dispel the garbage that is out in the media.